This is excellent! A definite keeper that we will make often. I purchased the zoodles pre-made which makes this recipe that much simpler! The point value listed is off. The only ingredient that has a point value is the olive oil which equates to 3-ish points. Super low point dinner option. Thank you! I’m wondering where the 7 points are coming from if veggies are free and so is shrimp? Is it the olive oil? If so, what else.can.I use? When I put this into the Recipe Builder on the WW site, I’m only getting 2 Freestyle points. I put in the exact ingredients listed. What am I missing? The only thing that even has points at all is the olive oil. Help!? I’ve reviewed the recipe and it seems to be Whole30 compliant. Just wondering why it doesn’t have the “W” icon listed. Even my pasta-loving hubby and son had seconds and thirds of this recipe! I added a box of Trader Joe’s carrot spirals and we sprinkled our full plates with some grated Parmesan, but it would have been delish even without those additions. Delicious!!! Very easy to make. I bought the zucchini already spiraled. This recipe says that its 6 points for the Freestyle program, I’m just wondering how?? I put the recipe into the recipe builder and it came out as 2 points. Typo maybe? Made this tonight and we loved it. you could really taste all the flavors. My only question is, how do you get 6 Freestyle points per serving? When i entered all the ingredients in the recipe builder it came out to 2 free style points for the olive oil and everything else was zero. Thanks for so many great recipes. I can’t see how’ve this is 6 FSP since only the oil has 2 points. You may want to update to correct points. I’m making this tonight! Are you using the recipe builder? The SmartPoints® calculator isn’t meant for recipes and will often give you the wrong points (usually higher) because it’s counting 0 points foods such as eggs, chicken, fruits and vegetables. So if you see a recipe with a SmartPoints® value that’s different from what the calculator tells you, that is why. Just made this to break in my new spiralizer…YUM! Didn’t have red pepper flakes so I substituted cajun seasoning. Can’t wait to make it again! Gina, I absolutely adore all of your recipes, and tell everyone and anyone about your blog and books. Almost every day I check your site to decide what to eat. Thank you for all that you do! 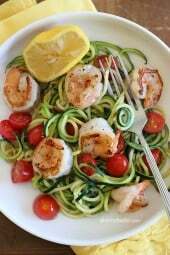 Can you please give an ounce amount of spiralized zucchini for good recipe? I am super short on time, and now buy The pre-cut spiralized zucchini at my local grocery store , so I’m not sure how much I should use. Please? i bought my spiloozer or whatever you want to call it , at Walmart Canada for 19.97$in my opinion, that doesn’t break one’s bank to purchase this item nor does it take up alot of room (made me laugh when i read that excuse)…its not rocket science people, its a light weight plastic kitchen gadget! 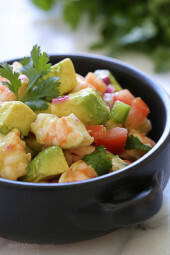 we really enjoy this recipe and your time to upload it to the net! I just put this into my weight watchers tracker and it is actually only 3 smart points not 8. Just thought you would like to know. I made this tonight and it was so flavorful and fresh! I usually don’t go for recipes with few spices because often they are bland. This was not!!! I loved it, it was quick, and I’ll definitely be making it again. A lot of people have commented on the difference between your sp values compared to when put into the recipe builder or calculator. I have both cookbooks and noticed the same thing on many recipes. Can u help me understand how you figure out the sp? I just don’t get it. Your values are usually higher and being a WW I would like to be accurate in counting points. Thanks for your great recipes and any insight you can give me. First, I don’t provide saturated fat so I don’t know how people are using the calculator. I use recipe builder for all my calculations, it’s the only way to get accurate smart points because vegetables are 0. But, if you use a calculator, the nutritional info will add points to them since vegetables and fruit have calories. Hope that makes sense, the real issue is why WW members don’t know about this. If you use recipe builder, and you are getting different results than me I am happy to figure it out with you! The way people are calculating points is 2 for the shrimp and 2 for the olive oil. Nothing else in the recipe has any points. I’m not sure why the recipe builder makes it 6 points. I’ve tried many of your recipes and all have been great but have never commented before. This was so yummy and super quick and easy! Love the ease of this dish but I needed more flavor. Added more garlic and red pepper flakes. Salt too. Wonderful recipe. I have just discovered spiralizing, so I was anxious to try this recipe. I was not disappointed. It was easy, and delicious. I did add a bit of the garlic while sautéing the shrimp and also sprinkled a bit of Parmesan cheese on the finished product. Gina, this looks great and I am going to try it tonight. I think you have the smart points calculated wrong though. I came up with 4 points. 2 for the olive oil and two for the shrimp. That it's so low in points is an extra bonus!! Mine is a Spirooli (as seen on TV), but purchased at Bed Bath 'n Beyond, used a coupon and it was just around $20.00. Love it, it works fine for the number of times I've used it. Hi Gina! How do you keep the zucchini from being soggy? Mine was soggy the moment that I spiralized it? How do you handle using it the next day to take as a lunch to work that has a sauce? do you separate them? Hi Beth, thank you for your reply. Yes, they were fresh. They had been in the refrigerator a couple of days. They ultimately turned out ok after I cooked them but when I first spiraled them was surprised at how mis they were. Do you know if instead of sautéing them, they can be baked too? I haven't tried baking them. I usually heat them in the microwave just until hot, no more than a minute or so, and toss them into whatever dish I'm having or use them as a base.. If it's spaghetti, I'll make a base of "zoodles", add spaghetti noodles on top (more for my husband, only a few for me), and pour sauce on top. I might leave them out for me and have both for him. He's beginning to ask for zucchini noodles now. As for baking them, Gina would know better than I would. If you do try baking them, please post and let me know. I meant to say I might leave out the pasta and use only "zoodles" for me and use both pasta and "zoodles" for him. I tried this for the first time today, I didn't have any crushed red pepper flakes but used Old Bay Garlic and Herb seasoning. Delicious is all I can say! Got my spiralizer last Friday and made this last night for dinner. My "zoodles" weren't perfect…but looked pretty good…and will get better with practice. This dish was delish. Even my husband (who is NOT a veggie fan!) cleaned his plate. And so quick and easy! This will be on my go-to dinners list. Just got my new spiralizer on Friday…plan to make this for dinner tonight. You don't say what blade to use…but it looks like it's the smallest one? Hubby is not a big veggie fan so I'm hoping this is a big hit! I've used my Spiralizer for months now and it took a few "trial and error" attempts to find what works for us. I spiralize with the middle blade usually (either will work) and do this ahead of time. For zucchini, I make the noodles and then store them in a plastic bag in the fridge with a paper towel to absorb moisture. They'll keep for several days. Just before serving, I'll heat each individual serving in the microwave for 60-45 seconds… only to heat. (When I've sautéed them, they release too much moisture and get soggy.) Then, I add whatever sauce I'm using. Since doing this way, my husband asks for them, too. I use on top just about anything we have and they work – even a quesadilla bake casserole I make. Great filler and way to cut down on carbs and get extra veggies. Your website is the best thing that has ever happened to me! And I have a fantastic husband and three perfectly wonderful children. Lol. I am a carb addict, and this dish was exactly what I would have normally made with pasta. I did not feel like I missed out by having this, and for 235 calories I am STUFFED! A little chocolate covered banana popsicle for dessert and I'm the happiest person. You are my new best friend. (Sorry Deanna). OMGosh!! Made this tonight and it was OUTSTANDING!! So fresh and bursting with flavor. Used twice the amount of garlic but that was just my preference…My new go to weeknight recipe!! This was so good! It is a really fresh-tasting recipe. 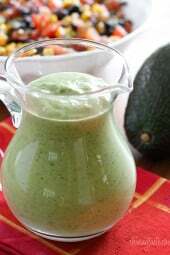 My husband and I put some fresh avocado chunks, and it brought out all the other flavors so well. Thanks for this one! Save to chop up and put in a spaghetti sauce? Got my spiralizer, loved this dish! So light, quick and easy and I will make it again for sure! Just got up from the table after feasting on your recipe. Delicious! I used a mandolin slicer. After reading all the comments, though, I might just have to put that spiralizer on my wish list. Thanks for the wonderful recipe! Made this last night. The only change was I used a can of drained petit diced tomatoes (don't care for fresh). Husband and I ADORED this!!! Can't wait to make more!!!! My zoodeler came in last week and last night I finally had time to try it out. So quick and easy. I made the dish and loved it. Planning on the greek cucumber tonight. I really could not get over how easy it was to make. Will be a go to fast meal for future use. id liketo try recipe but have no noodle spiral, any other way to make this? I just bought the paderno spiralizer on Amazon, and got to try it out yesterday for the first time with this dish. SO good! My boyfriend and I both loved it so much. It was also my first time cooking shrimp – success! So flavorful and surprisingly filling. Bad news is that I think I'm addicted to spiralizing now. making this again for dinner tonight! had no left overs last time! Just got my Paderno spiralizer from Amazon. Made this for lunch today and it was AMAZING. My husband couldn't believe it wasn't pasta. He loved it. I think the secret is to let the zoodles weep a bit (with salt) and to also be generous with the garlic, lemon and red pepper flake. My husband LOVED how spicy it was. Major winner here!!!!! Gina, I received my spiralizer two days ago and made this dish. It was so good. Zoodles are my new noodles! Can't wait to try other vegetables! I was leary to serve them to my husband, so I cooked pasta for him. He tried the zoodles and liked it! So what do you do with the big long piece that comes out at the top? The one that is a straight columb-not curly? Or am I just looking at it wrong. I looked at a video of this on WilliamSonoma and saw that piece as well. They sort of hid it in the video. Is this a 'core'? Hm. Looks like it. Eat it! It's still part of the fruit/veg you just spiraled, so unless it's made up of just seeds (like apple core), I'm sure it would still be good to eat. It's not like tastless pulp left from juicing. Some probably pitch it,compost it, or feed it to their animals. God awful. Nobody ate it. Just love my zoodle maker. Made rice with butternut squash and the orange chicken. Out of this world. My husband loved it. Thanks again for all the wonderful recipes for the zoodle maker. This looks great! I have a small handheld spiralizer, but it only works for cylindrical veggies (carrots, zucchini…). Does anyone with experience with the Paderno spiralizer know if it works for veggies of all shapes…. sweet potato, jicima, etc? I got the GEFU spiralizer from bed bath and beyond and it does the same job. There is also no possibility of slicing your fingers with this one unless you are intentionally putting you fingers into the tunnel to see how sharp the blades are. I am making this recipe at the moment — can't wait to try it. I make zucchini noodles all the time, and for those of you that are having problems with wateriness it really helps to sprinkle generously with salt, toss and let "sweat" in a colander for 20-30 minutes while you do something else. I usually will give it a few press downs with a paper towel while the colander sits over a bowl. This extracts a lot of water that you can just dump out. I give mine a good rinse in cold water to get rid of the salt, one more quick pat down with paper towel and add to a hot skillet with a little coconut oil. You'll be surprised at how much water the salt draws out. Thanks for this tip! I'll do this next time I make the noodles. I've discovered that I can make the noodles, put them in a colander over a dish, and they will keep a day in the fridge. Not much water comes out, though, so I'll do what you do with salt. I served them last night as a side dish to fish. I sautéed onion, added a can of RoTel mild tomatoes, tossed in the noodles, and topped with a little 2% grated cheddar cheese. My husband didn't like them until I added the cheese and then he loved them. So fun to find new ways to incorporate them into our meals. i totally need this in my life because that recipe looks amazing and gluten free! you're the bomb. I noticed Amazon says 2-4 weeks just to ship the slicer. I would expect that kind of delivery time only from a mail order catalog that showed up with the rest of my junk mail. I found it at Williams-Sonoma for the same exact price, except I can just go pick it up! Made this for dinner tonight. It was awesome! Mine wasn't as pretty as yours, but with a little practice with my new kitchen gadget, will help. I added bean sprouts, which was great. Next time, I'll try it with chicken and snow peas. And, experiment with different seasoning, and flavorings. The possibilities are endless. Thanks for another great recipe, Gina! Looks really delicious, I'm definitely want to try this. If you want to save money, I found a cheaper version that does spiraling for vegetables: http://www.taylorgifts.com/item/veggetti/39908. I'm not sure how well it works but it might be worth a try! I have a Paderno Spiralizer and love it. I bought it on Amazon – cheaper than at Wms.-Sonoma. Hungry Girl reviewed this Veggetti recently, though, and gave it a thumbs up. Wonderful, so thrilled you found me and that you liked this dish!! I'm loving all these carb free and paleo posts because of the variety, but I'm getting worried that you haven't really posted more 'normal' recipes for a while. I love this site because it offers recipes for stuff I would eat everyday, just lightened up. Don't go totally non-carb and paleo on us Gina! Nope, I could never go completely non-carb, I just like to cut back. In fact I just posted fish sticks with breadcrumbs yesterday, and those have carbs. I love everything in moderation, and although I had this for lunch, I also had rice with dinner. This looks so delicious. It reminds me of a shrimp scampi recipe my mom used to make for me as a child (obviously, she didn't use zuchini for noodles). This looks tasty! What do you do with the core piece left from spiralizer? I don't have a gadget for spiraling, I think I will try this with spaghetti squash. Looks amazing! And pretty perfect for the Whole30 month I'm doing right now! If you don't have a spiralizer or mandoline, what's a DIY way to make the zucchini noodles? Just cut zucchini really thin? Cut them into matchstick size pieces. I do that sometimes when I get tired of the long noodles. Slice them into 1/8th inch thin slices. Then cut the slices into 1/8th inch thick strips. I'm not a huge tomato person. Do you think red bell peppers would be good? Hi Gina, what camera do you use for your pics? They look gorgeous! Thank you for everything you do! I have a Kuhn Rikon Julienne Peeler that works just as well as a spiralizer, and takes up much less room! and costs a lot less too! I make this dish often and my family loves it! I like use 3 of these: zucchini, yellow squash, carrots or sweet potatoes together to make it colorful and interesting! im ordering this tool off amazon now!!! I bought the same exact noodler for me and one for my mom a few years ago. I probably use mine every two weeks. It's awesome! Wow, I actually thought the noodle was a fancy pasta noodle with zuchini. I'll be keeping my eye out for one of those tools. The recipe sounds divine! Thanks for sharing. This looks yummy – thanks, Gina! I was just shopping online for a spiralizer yesterday, so I will have to christen it with this recipe when it arrives. (I have been using a julienne peeler to make my zoodles and it's not as easy or pretty!) And not to mess with your recipe, Gina, but a tip for those who don't like to cut carbs out completely (as my husband, who isn't completely sold on the zucchini-as-noodle idea) – I have added in a small amount of whole wheat or Barilla Plus (GF might even work) spaghetti to my zoodle recipes. You basically want the cooked amount to be less than or equal to the amount of zoodles, so you have to eyeball it until you get used to the correct portioning. e.g., for one large zucchini, I would use about 1/8 box of spaghetti. If the zucchini is short in length, break the pasta in half before cooking. Sorry I don't have nutritional info for this but that's not my thing – just portion it out wisely and you'll be fine. LOL — If you had bothered to look at Gina's link, you would see that her Padermo is the EXACT SAME as what you just linked to. Hers is called: "Paderno World Cuisine A4982799 Tri-Blade Plastic Spiral Vegetable Slicer"
How do zoodles reheat or do you eat the entire portion at one sitting? What do you do with leftovers? I always make them fresh and eat them the same day. Looks so fresh and yummy, can't wait to make! You've sold me on the slicer too! Just ordered this slicer thing using the amazon link you provided. I've never shopped on Amazon cos I'm in Australia and eBay seems to be the easier option. Can't wait to get it in late May!! Zoodles here I come! I love amazon, they make it too easy to shop! Love this recipe, Gina. Looks so light and fresh and springy and healthy! Love zucchini, too! I got my spiralizer at Amazon and it's less than Wms-Sonoma charges. I do love it, but one problem I've had is that the noodles sometimes are too watery. Any ideas on how to overcome this? This recipe looks delicious! Zucchini has a lot of water – try setting the noodles on a paper towel before cooking to soak up excess! I find sauteeing them for 1 1/2 to 2 minutes TOPS is key, and quickly remove from the hot pan or it will keep cooking. I made this recipe the other night – my 15 year old son LOVED it! But the zoodles were way too watery! I'll try not to cook them so long next time! Yum! I have really been wanting to try zucchini noodles, this looks perfect. That's it I have to have a spirilizer! I saw on on Williams Sonama for $20-$30, I'll have to check out your link! Just received my spiralizer last week….fabulous! I just posted a recipe on my blog for zoodles too! I think we have the same spiralizer also 🙂 Love it so far! Amazon…..the kuhn rikon is a good quality one! I love mine! I got mine at BBB. Three types for $15. Another hit and drool worthy recipe. I'm a bit of a thrifty person but I really like that spiral making device. How much does it cost? I'll definitely try this one at home. I'm just crossing my fingers on this one, hope I won't burn anything this time. Last time, about a week ago, I tried this delicious recipe I found and stopped half way because the pot holder got burned and also the food. Well, there's a first time for everything, right? Great recipe! I got a spiralizer in January and love it! Where/how do you get the slicer thing? There's a link in Gina's post. Look at the sentence "My Paderno Spiral Vegetable Slicer is my all time FAVORITE cooking gadget." Click on the words "Paderno Spiral Vegetable Slicer" and it takes you to Amazon where you can buy it. Why is this considered 6 PTS? 4oz of shrimp is 3 PTS and the olive oil is 2 PTS. everything else is free.. I agree the points are way off. Now with Smart Points 4oz of shrimp is only ONE point and the olive oil is 2. Everything else is free, for a total of THREE. 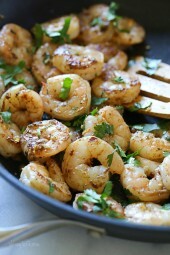 I know this is a great recipe cause I've made it several times with grilled shrimp and also with grilled scallops! Ever since you introduced me to zucchini noodles, I can't get enough of them! LOL Along with the shrimp, I have added grilled asparagas, peas, julienned carrots! Always delish! Thanks Gina! Amazing! Making this next week for sure! I DO need one of these if I plan to grow zucchini this year! Zucchini noodles is one of the only healthy substitutes I can pull on my carb-loving fiance…so it might be time to splurge on another appliance 🙂 Thanks for sharing this! Looks delish! Think chicken would work as a replacement for the shrimp for those of us who are allergic? I also use chicken sausage- yum! I made this this week! Garlic lemon shrimp on top of zoodles. I absolutely love the zucchini noodles, I treat them like pasta and I do not miss it at all. By the way Gina. My office is having a cinco de mayo cook-off, and I've decided to make your jalapeno poppers. There is a prize involved so I want to win! I was thinking of getting up early to make & bake them, then have them reheated in an oven a few hours later around lunch in an oven. Do you think they will hold up their crispiness? I think they would be ok, you should probably do a test run to see how they reheat. Good luck! I have made Gina's jalapeno poppers for my family and they loved them!!! They reheat very well! I love my Paderno spiral slicer too.. however I did have an "incident" the first time used it… ended up having 5 stitches in my finger tip! So, be careful.. IT BITES! 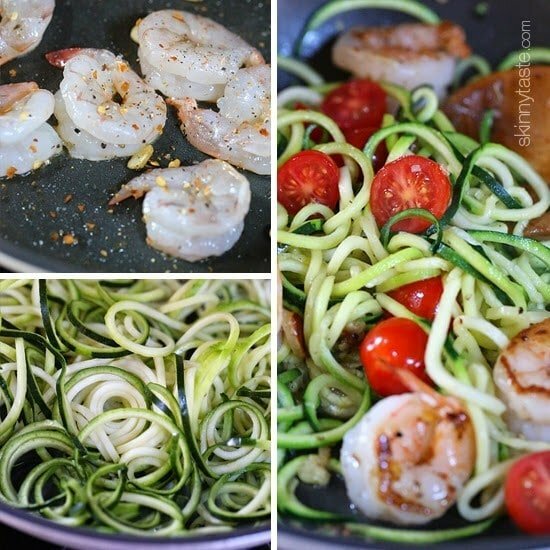 However..the zoodles… ARE THE BEST!!! I almost think they taste a little better when you reheat them. Now I need to make jalapeno poppers. lol. I JUST bought the Panderno Spiralizer last week and haven't had a chance to try it yet. I have my first recipe now and will give it a test "spin" (har har) this weekend! Imagine telling kids your going to have "zoodles" for dinner! 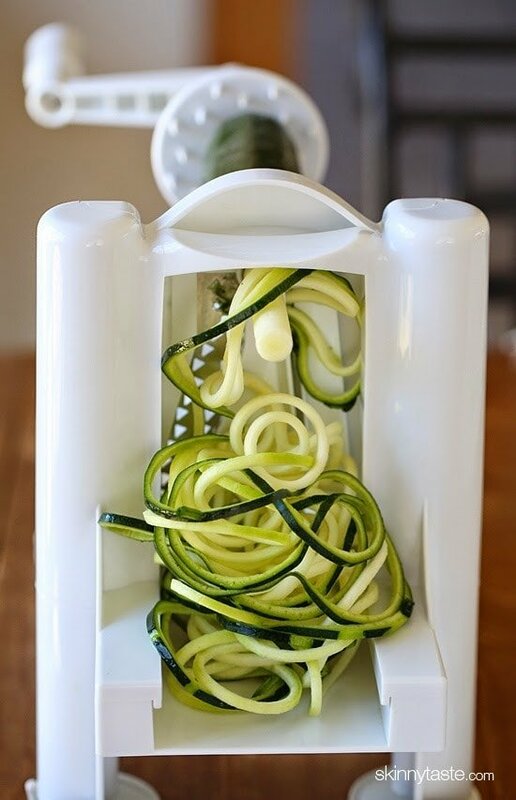 I have this exact same spiralizer & love it too! Trying this soon! I have this one too! Isn't it just the BEST thing EVER? Now I have my mom & 2 diabetic friends who want to buy one too. curious, do you happen to know if your spiralizer makes thinner zoodles than what I get using my spiralizer (shaped like a hour glass)??? Great recipe! Thanks for the info on the gadget as well. I threw my mandolin away in anger after I had an accident making something for my blog. I'll look it up.